Some 300 prehistoric worms were analysed – and two ‘were shown to contain viable nematodes’. Fascinating stuff. Couldn’t read further though….’bad gateway’. I can see the next Guardian headline – Global Warming releases ancient worms that were thought safely frozen. So 32000 years ago it was warm enough for squirrels to make burrows. I’m surprised they didn’t find any buried SUVs and manage to start them, once they had thawed out. 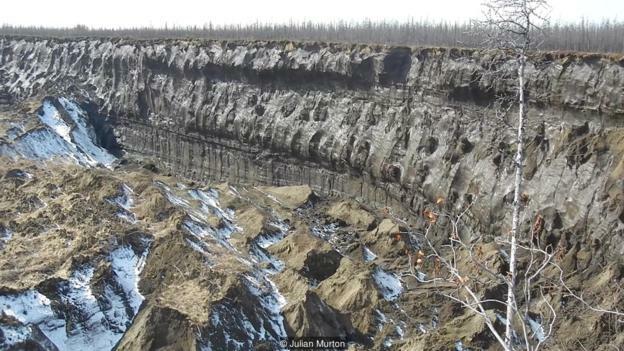 “Péwé said the frozen forest at Eva Creek thrived at a time that was up to 5 degrees Celsius warmer than it is today, when there was little-to-no permafrost. Because the frozen forest is full of charred trees, Péwé suspects there were a lot of forest fires 125,000 years ago. Insect galleries carved into the bark of some of the frozen spruce indicate that the spruce bark beetle was also here then.